Ivanka Trump’s clothing line made by Chinese factory workers earning $1 an hour. 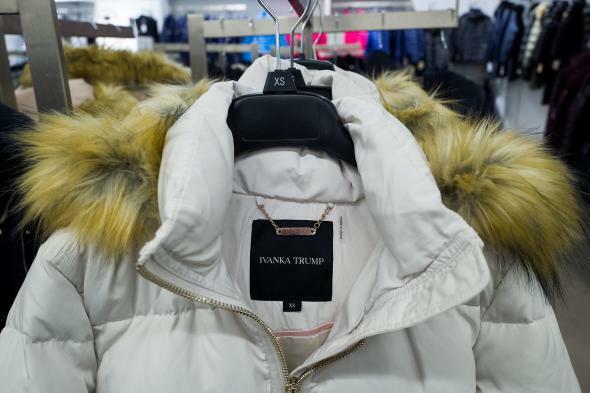 A view of an Ivanka Trump brand coat for sale on Feb. 10 in New York City. The October 2016 inspection of the G-III factory—carried out by an industry self-monitoring collective, the Fair Labor Association, which includes companies like Nike—found two-dozen violations of international labor standards as determined by the United Nations’ International Labor Organization. The G-III factory also produces clothing for other brands, including Calvin Klein and Tommy Hilfiger. Workers at the G-III factory in China were required to work 57 hours a week “on a regular basis” to hit production targets, inspectors found. Though Chinese law sets the limit for overtime at 36 hours per month, workers in all of the factory’s departments exceeded that limit, working up to 82 hours of overtime a month between September 2015 and August 2016. The factory’s workers made between 1,879 and 2,088 yuan a month, or roughly $255 to $283, which would be below minimum wage in some parts of China. The average manufacturing employee in urban China made twice as much money as the factory’s workers, or roughly 4,280 yuan a month, according to national data from 2014. Inspectors also cited the factory for a number of workplace safety concerns.